Eastshore Islets Camp is a small camp located in southern Auridon, south of the town of Silsailen. 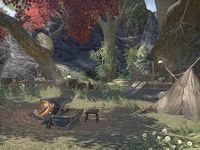 The camp is located on the beach beneath Valano Manor and is home to a special crafting site, where you may craft items in the Death's Wind set. This page was last modified on 19 November 2018, at 05:12.